Video content is a powerful and strong way to send a marketing or motivational message. In this article, we will discuss how you could build your own video to send a message of your choice. There is no doubt that mobile devices are taking over old-school personal desktop computers and notebooks. Google announced in 2015, that they would expand mobile-friendliness as a ranking signal. In a recent article by the content marketing institute, the writer indicated visuals of how people react to content through various ways of testing eye movement. Google conducts knowledge graph studies to proof what readers look at when visiting mobile websites. The study indicated that readers react more to images than text. Reading all the above just confirmed that the industry is going through a revolution – mobile is definitely the most important medium and marketers should comply with the demand for more relevant content. This brings me to something I found quite fun to do. Video content. I decided to set up a “Pump-up” video before the Swimming South Africa 2016 regional championships which are the biggest championships in every age group swimmers’ life. Our swimmer is still just 9-years-old, so a very young swimmer but we like to do things the way the professionals do as it keeps us in the loop both in the swimming and marketing world. A lot of focus is given to swimming correctly – i.e. the execution of the strokes are correct which leads to swimming faster. Great success is achieved through swimming correctly and training alone. All of the above is inspirational and younger as well as senior swimmers respect her for her abilities and she is stronger as a result. We now had a storyboard or story line so we needed the video material. As swim parents and our swimmer’s coaches, we record all events in order to look back at each event to decide the way forward. We also use the material to consult the coach that provides the training programs. So we just had to dig into our existing video library to see what was available and how we could use it to compile a motivational video. Underwater video of each stroke. Executing the strokes alone during training sessions. Winning races by swimming that stroke correctly. As this was just an experiment and example, I just used what was available and did not venture into analyzing and buying the most expensive video content software on the market. 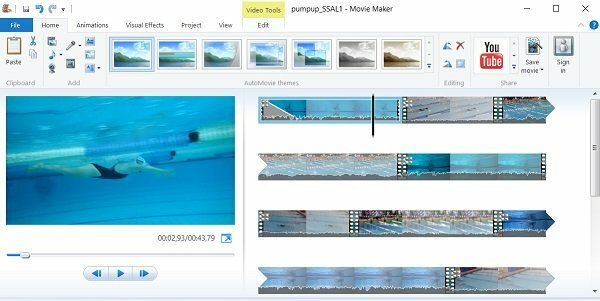 I simply used Microsoft’s Movie Maker as it was readily available. I must say, this movie maker is really easy to use. You simply click on “Home” then “Add video” and compile your clips the way you want. It might take some time just to get used to the animations, length of video clips etc. but playing around with it for a while soon resulted in a raw copy of the video. Our video’ s visual material was ready and the duration was under a minute which is acceptable for platforms such as Youtube, Facebook and Google+ etc. Music is a difficult topic in the sense that copyright issues exist. We wanted some music that excites the viewers and fitted in with the activities and visual content – i.e. something that could create a hype. Browsed around a bit but all music clips were copyrighted and came at a high price. Browsing for “royalty free music”, landed us at Youtube’s audio library. Listen to the royalty free tracks. Choose the appropriate track to match the video. Use Google’s effects to round the video off. We used rolling thunder and a Canon shot for effect! We were quite happy with this motivational video and published it. Twitter allows only 30-second videos and Instagram 20-seconds. Cut the video content but make sure that you still send the same message. Doing this, is a bit tricky when making an Instagram video. At the swim meet, some of our followers said they loved the video. These comments serves as confirmation that we sent the same message. For Twitter we made this version which is 30 seconds. ‹ Swimsuits – old school racer back or skins? I’ve been exploring for a little for any high quality articles or blog posts on this sort of area . Exploring in Yahoo I at last stumbled upon this site. Reading this information So i’m happy to convey that I have a very good uncanny feeling I discovered just what I needed. I most certainly will make sure to do not forget this website and give it a glance on a constant basis.